Bryant (population 255) is located in the west central portion of Illinois in the east central portion of Fulton County. Bryant is about 6 miles northeast of Lewistown and 35 miles southwest of Peoria. Illiinois Route 100 is the main roadway to and from Bryant. County highway 4 also takes you to Bryant. The Burlington Northern Railroad passes through Bryant as well. "(Bryant) Was laid out by William Hummel, April 13th, 1863. It is on the Chicago, Burlington, & Quincy railroad, and is the point where is located the Forsyth coal mining Company, which will, in time, make it a much larger town." The town was named after Lemuel O'Bryant or Henry Bryant, it is not certain which. 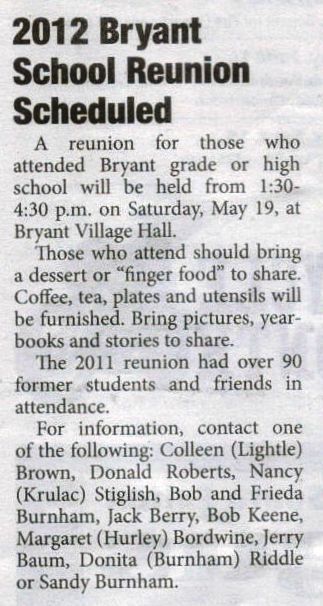 We believe that Bryant High School was a two or three-year high school. It likely existed from the 1920s through the 1940s. We do know by checking out Illinois high school basketball District Tournament scores that the high school was still going strong in 1935 (please read below). 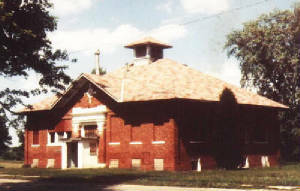 We know that the high school-aged kids of Bryant today attend school in nearby Lewistown. 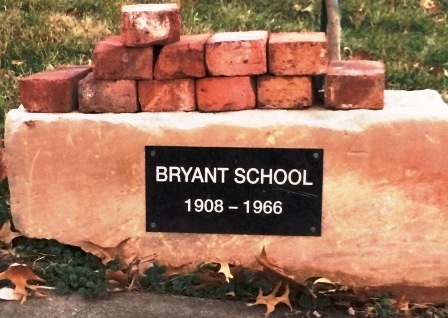 Below is a photo taken in 2015 of a marker that signifies the existence of the Bryant School. From the web site address of http://sites.google.com/site/xtmi2000/il1935dist-1 . In the IHSA 1935 District Tournament held in Canton, Bryant High School was defeated by London Mills 23 - 18 to end the Bryant boys' season. Knowing that basketball was definitely played at Bryant High School it is likely that other sports such as baseball and track were offered as well. Were band, chorus, FFA, FHA, dances, and other activities offered at Bryant High School? If you have this information, please dro us a line. 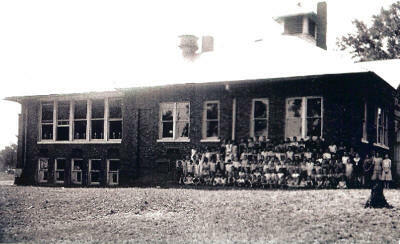 A link to a copy of a 1940s yearbook and some nice photos for Bryant Grade School was sent to us by John Bybee. Check it out at http://www.illinoisancestors.org/fulton/Schools/bryant_school.html.